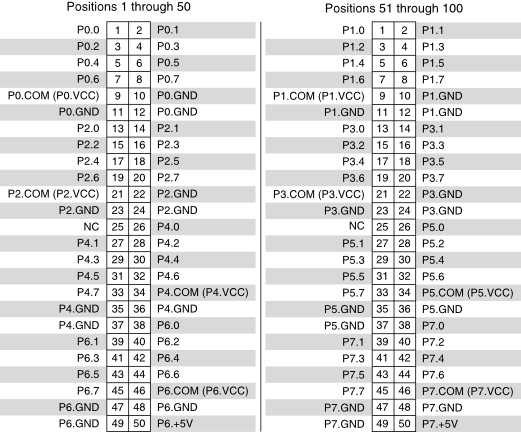 Port 0 Digital Output Channels—Data lines for port 0. Port 0 Common—Common line for P0.VCC. Isolated from the computer ground signal. Port 1 Digital Output Channels—Data lines for port 1. Port 1 Common—Common line for P1.VCC. Isolated from the computer ground signal. Port 2 Digital Output Channels—Data lines for port 2. Port 2 Common—Common line for P2.VCC. Isolated from the computer ground signal. Port 3 Digital Output Channels—Data lines for port 3. Port 3 Common—Common line for P3.VCC. Isolated from the computer ground signal. Port 4 Digital Output Channels—Data lines for port 4. Port 4 Common—Common line for P4.VCC. Isolated from the computer ground signal. Port 5 Digital Output Channels—Data lines for port 5. Port 5 Common—Common line for P5.VCC. Isolated from the computer ground signal. Port 6 Digital Output Channels—Data lines for port 6. Port 6 Common—Common line for P6.VCC and P6.+5V. Isolated from the computer ground signal. Port 6 +5 V Line. Port 7 Digital Output Channels—Data lines for port 7. Port 7 Common—Common line for P7.VCC and P7.+5V. Isolated from the computer ground signal. Port 7 +5 V Line.